The table shows mean Wordsum scores for whites born in various decades and measured each decade starting in the 1970s through 2008 (GSS data). Looking at whites born in the 1950s, the mean jumps up from 6.01 when they were in their twenties (in the 70s decade) to 6.55 in their thirties. You see a similar increase for the 60s birth cohorts from the 1980s to the 1990s. (Increases for both groups are statistically significant). This shows that voculabary grows during one's twenties. There are not significant increases as people move into their thirties and beyond (although the 30s-40s increase for the 1950s cohort is close to statistical significance). This is an interesting finding. I knew that vocabulary was loosely correlated with age, but it looks like the gains are made specifically in one's twenties. People are probably expanding their vocabularies as they are required to learn less common words in college and at the workplace. Also, this finding reminds us that cohort, period, and age effects complicate the study of the Flynn effect. White Americans born in the 40s and 50s end up with Wordsum averages that are significantly higher than that of the 1930s birth cohort. Those born in the 1960s, however, end up with a mean not significantly different than for those born during the Depression. Something happened to people born in the 40s and 50s--the Baby Boomers, roughly--that gave them larger vocabularies than the cohorts before or after them. The improvement over the 30s cohort seems understandable, but why the decline in the 60s cohort? The 70s cohorts looks like it will end up the same as those born in the 60s. It seems like something has slipped among whites in the past few decades. Explanations like nutrition don't seem to work. I'm not sure how family change would make a big difference. Declining educational standards? Less reading? When the '60s cohort was in their 20s, it was the 1980s. There was a huge dietary shift away from protein and fat, and toward carbohydrates, sometime during the 1970s. The prevalence of obesity, for instance, only shoots up in the late '70s or early '80s (from the NHANES data). And this has not changed back since then. Fat and cholesterol are crucial for learning and memory, so when people start relying more on potatoes, pasta, bread, and fruit juice, compared to bacon, eggs, cheese, and milk, we'd expect them to have somewhat lower vocabulary scores. For example, the '30s cohort ate less red meat than the '40s or '50s cohorts. I have a graph of red meat availability per capita at my blog (search "brody"), and there are two peaks: one in 1944, which looks anomalous, and another in 1971, which is the culmination of a steady increase, and preceding a steady decline. I think the same thing accounts for the stalling / reversal of the Flynn Effect among the British. We've been eating a lot more empty carbs (especially sugar), and not enough fat and cholesterol, compared to the pre-anti-fat hysteria period. That began in force sometime in the mid-1970s, with Senator McGovern telling us all to start pretending that we're rabbits, birds, or cows, instead of human beings. Lisa: "Oats are what a champion thoroughbred eats before he or she wins the Kentucky Derby!" Homer: "Newsflash, Lisa, Bart is not a horse! Eat your steak, boy." One-trick pony. One trick is all that pony knows. "Fat and cholesterol are crucial for learning and memory, so when people start relying more on potatoes, pasta, bread, and fruit juice, compared to bacon, eggs, cheese, and milk, we'd expect them to have somewhat lower vocabulary scores....We've been eating a lot more empty carbs (especially sugar), and not enough fat and cholesterol, compared to the pre-anti-fat hysteria period." The low/no fat nonsense is causing autism. Young brains need fat! Clem, I know of a mechanism that can explain the data -- and you don't. Let's get real -- there are no lowering standards, expectations, etc. The education bubble is bigger than ever, children are held to ever higher standards (in California, you must pass algebra II to graduate), and everyone is supposed to go to college, get an advanced degree, etc. Given that, what major shift do you know of that occurred at the right time and would have the observed effect? Kids born in the sixties were not asked to read anything much. I am still catching up now. I finally read Wind in the Willows as a bedtime story for my kids, just last year. We certainly never had any books suggested to us or made mandatory reading like that. I think we just had a culturally deprived schooling. In grade school a trip to the school library was a very rare treat. I can remember each occasion it happened. Our middle school library had four or five short racks of books, not much of any enduring worth. The only 'literature' I was ever asked to read in school was Huck Finn, twice. I'm not dismissing Agnostic's ideas about diet (though I wish I could, 'cos the guy's so obnoxious), but there's also evidence for a general dumbing-down of culture post-1970s. This was a result of the 60s cultural revolution, which destroyed the old highbrow/middlebrow/lowbrow hierarchy and left the media pandering to pop-culture-influenced tastes (essentially anti-intellectual). I ran some of Time's Man of the Year articles through a readability analysis, and it looks like their language became notably simpler after the 1980s. So, it looks like sometime in the 90s, Time dropped its reading level by more than 2 years. I expect its vocabulary diminished in step. A couple of problems. First, the data set is small, and Time is not a perfect representative of all media. Secondly, Time's dumbing-down comes too late to account for the 60s cohort's lack of gains during the 80s. You could argue that Time (or the media in general) were forced to dumb down in order to connect with the cholesterol-starved brains of the new generation. My guess, though, is that Time was a stylistic laggard, and their decision to dumb down their language was motivated by the spread of dumbed-down language in the rest of media earlier in the 80s. Newspapers shifted to the slicker, punchier style of USA Today, while losing share to the even more dumbed-down language of TV news. It'd be worth researching this further. I think readability analysis is a promising approach. 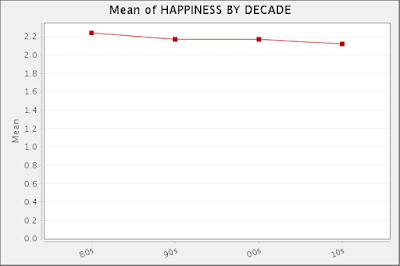 Though the decline is continuous, there is a sharper drop-off between the 50s and 60s cohorts than previously. Combine that with what I've suggested was dumbing-down of journalistic language in 70s and 80s, and it's not surprising we've got a drop-off in general vocabulary, despite (as Agnostic points out) continually higher educational standards. Ron noted that people used to fill out their vocabularies in their 20s - at least that's what WORDSUM suggests - when most people are (and, especially, were) out of school. So, if there's a cultural explanation, it's something in the general culture, not the educational system. Mind you, I'm not totally dismissing the high-carb idea, but some hard (hint: cross-regional, cross-national) evidence would be nice. Television. TV killed the upward trend. I was a kid while TV was reducing the US population to drooling zombies mesmerized by the idiot box. Some of you youngsters may not understand that people watched close to zero television before 1950 and watched very little before 1960. The idiot box did not capture everyone's waking hours until the 1970's. Us Baby Boomers have been self-absorbed and obnoxious, but we were pretty smart. You're going to miss us when we we're gone. I don't doubt television had something to do with it, but according this source, television rose just 18 percent over the 1960s. Those of us who were born in the late 50s watched TV till our eyes bugged out, but our vocabularies turned out just fine. I'm still leaning towards the idea that all media started using simpler language, so people simply heard and read less vocabulary. "(The upward trend resulted from urbanization, but the rural population was negligible by the 70's.)" "Us Baby Boomers have been self-absorbed and obnoxious, but we were pretty smart. You're going to miss us when we we're gone." They'll despise us when we're gone, once they realize what we've done: reading all the books in the library, then blowing up the library. "Us Baby Boomers have been self-absorbed and obnoxious, but we were pretty smart." Hmmm, that's a curious thing to say, Steve, especially as you've written so extensively on the slackening pace of cultural achievement during the latter half of the 20th century. It's interesting that so many of the individuals whom we associate with the greatest Boomer intellectual achievements, particularly the musicians, were actually children of the war years, and thus pre-Boomers (i.e. Dylan, Clapton, the Beatles, the Stones, etc. ad nauseam). To the extent the Boomers have displayed "smarts", it's as consumers of intellectual material, not as producers. Who is the greatest Boomer public intellectual, anyway, Steve? Chris Hitchens? Qui est le Boomer-Barzun? "'cos the guy's so obnoxious"
Amen, brother. My sympathy to the junior colege students who'll some day be forced to suffer through his confused bloviating. Not to mention those who'll have to rebuff his awkward sexual advances. No one has mentioned video games yet. Video games became affordable for the masses in the early 1980s, just in time for the people born in the 1960s to be in their twenties. Video games plus the spread of cable television and the falling price of video players equals less time spent reading.